Mowing. It’s a simple task once you get the hang of it. In fact, many people find it relaxing and enjoyable. However, it doesn’t exclude the fact that a lawn mower is a heavy piece of machinery. And now that prime mowing season is starting up, it’s important to take a few extra precautions in order to keep everyone self. 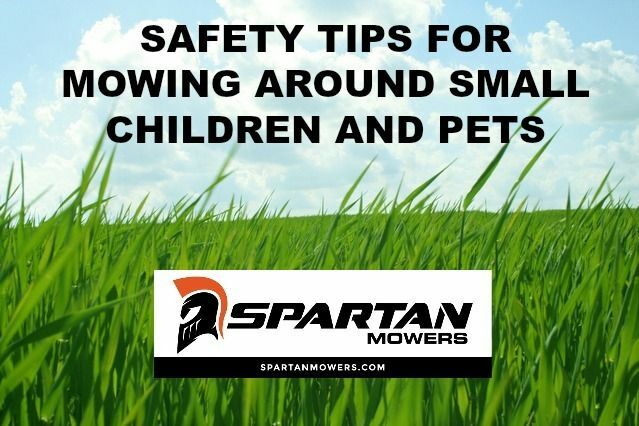 Here are just a few tips to help make mowing around small children and pets a little safer while you use your Spartan Mower to get the perfect lawn. This may be easier said than done. If it’s a nice day out to mow, then chances are high that it’s also the perfect time to play outside and soak up a little vitamin D. However, accidents can happen in a blink of an eye regardless of how diligent you are. The best thing to do is keep them inside if you can, and if you can’t, then choose another time to mow when the kids are away with friends or grandparents. Most people begin their weekly or bi-weekly mowing ritual by going around the yard and picking up debris that may have fallen. If strong winds or a storm has passed through your area since your last mow, then you may have more sticks and debris to pick up than usual. And if you have kids or grandkids, then you should keep an eye out for toys and sports gear. Pets are also known for bringing items into the yard without you knowing about it. This one simple task of picking up larger objects and debris not only keeps you from running over Suzie’s favorite dolly, but it can help ensure you have an even smoother ride on your Spartan Mower. It is so tempting to put your little sidekick on your lap as you check off your weekly chore. Bonding time, right? With so many things that could happen, having a small child or a small pet ride in your lap is probably not the best idea. When it comes to cleaning up your lawn and getting the professional look you desire, there are often several tools involved to get the job done. In addition to your mower, when it and other tools are not in use, then they should be completely turned off. If using electric tools, then make sure they are unplugged. These are just a few small safety tips to think about as you start up another mowing season. To discover more about Spartan Mowers and view our specs, check out our website. Here you can Build Your Own Mower, shop mowing accessories, or find a DEALER near you by clicking on the DEALER LOCATOR.